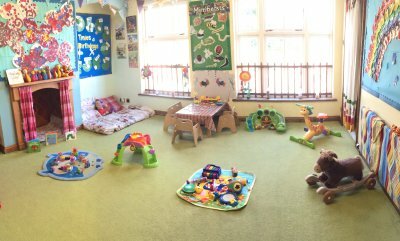 The Baby room offers a friendly relaxed family atmosphere for children, from 6 weeks to 2 years to develop. The babies can explore and learn through one to one activities with staff and play equipment provided. Stimulation at a young age encourages happy, inquisitive babies to become confident toddlers ready to grasp the concepts of learning skills for later on in life. The babies are encouraged to join in simple activities, which improve their mental and social awareness. The babies have the use of 4 rooms in the nursery, along with garden play and going out for walks in our pushchairs. The babies have a messy room which they use to be creative with different materials such as; paints, sticking, colouring, and junk modelling. 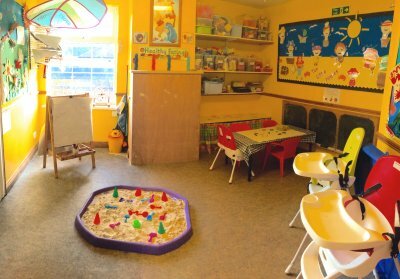 In this room they also have access to sand, water and sensory play; such as coloured rice, jelly and shaving foam. The babies also have a cot room where we allocate a cot to each child. The babies can use this room throughout the day to suit their daily routine. During the time that the babies are sleeping we use a monitor as well as the staff carrying out 10 minute physical checks. Babies are regularly taken out for walks to town to the pet shop and the duck pond for a picnic.